This is a long and sleek makeup bag – kind of like a grown-up version of a pencil case! And this bag goes with the theme of the month – almost all the products are eye makeup or skincare related! This wasn’t as dramatic as the regular version (but it was close) and it stayed put all day. This sample is so tiny, but it’s actually half the size of the full-size version! The formula is oil-free, blends out evenly on my lids, and keeps eyeshadow in place – it’s great! Another tiny sample, but I’m happy to report that this tube is almost completely full! The formula is a lightweight gel designed to “visibly improves dark circles, puffiness, and bags.” I’ve used it a few times and haven’t noticed any improvements in those areas, but it is very hydrating and gentle. This gel/cream hybrid is so rich and left my skin feeling softer and smoother. And it’s supposed to brighten dark circles in 3 weeks – hopefully this sample will last that long! This eyeliner is a deep black with excellent pigment. And no smudging once it sets. This cologne is a woody scent with notes of mandarin, lavender, and green botanics. And this month Macy’s sent two perfume samples! The women’s version is a woody floral with notes of Eucalyptus Acorns and Orange Flower. Verdict: This box has an estimated value of about $54.55 (not counting the makeup bag.) 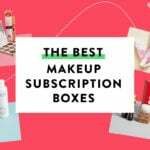 I think that’s a great value for a $15 beauty box considering they include a $5 coupon code. And the bag this month is extra cute! What happened to this subscription? Yea Macys really did a terrible job with the customer service aspect of this box. I was somehow able to sign up without having an account, and now they are telling me I have to cancel through “my account” or call customer service to cancel. All other subscriptions make it so easy to cancel, macys certainly did not. For anyone who is contemplating this box, just get sephora play. Its cheaper and the customer service is 500 times better. I really wanted this bag so I signed up this month for the very first time. I was told by a representative that I would for sure receive this months bag and since they already charged my card $15 so I was completely thrilled. A few days later I talked to Macy’s to find out why I haven’t received any confirmation emails. They told me that I’m No where in their system as having an active subscription even though I can sign in my acct and it says I am a subscriber and my subscription is active. PLUS they have already charged my card on the same day that I signed up. Then they tell me that I will Not be receiving a October Box, but my card will be charged for a November box and I will receive a November box for my first box. HUH??? Am I seriously going to be charged Twice for a November box??? PLUS they still can’t tell me why I haven’t received any confirmation emails, but they sure did charge my card! I am so frustrated & disappointed, but I’m going to stick it out and see what happens. Has anyone else ever had these same problems with Macy’s Beauty Box?? I find that Macy’s has one.of the.most exciting and creative bags and then Ipsy. I may join because they are trying and delivering. I signed up for Macy’s Beauty Box this month on Oct 17th which is also the day they also charged my card $15 and first I was told that I would receive a Oct box then a couple days later my acct said next billing will be for Nov box. I then emailed Macy’s to find out why I haven’t received any confirmation emails. They emailed back and told me they couldn’t find me in their system even though I have an acct that I log into that says my subscription is active and they already charged my card and then told me that I would Not receive a Oct box. Now I’m trying to figure out why they are charging me for a Oct box if I’m not going to get one and if they are going to charge me a second time for a Nov Box. Oh and I still have Not received any confirmation emails. I also had 3 different Reps telling me something different. Now the only email I’m getting is them telling me that I’m Not going to receive a Oct Box which then I told them I could care less whether or Not I’m getting a Oct box at this point. I just don’t want to be charged twice for 1 box! Plus I just want to know why I’m not found in their system which is probably why I’m Not receiving confirmation emails. Yet Still No explanation of any of those issues. Has anyone else had these kinds of problems with Macy’s Beauty Box?? The bag looks like it could make a nice sunglasses case but I can’t quite tell how large it is. That bag appears to be the perfect size as a spare eyeglass case, of all things. I had the same result with the eyelid primer but hey… I got to try it and find out and that’s the whole point! I also didn’t care for the mascara formula, but I also don’t usually care for waterproof formulas period. The point is I got to try several item new to me and that makes this months bag a total success! I thought this was one of the best boxes I’ve ever gotten from Macy’s and was completely satisfied with it. Macy never disappoints me. I absolutely love this bag and its contents. Doing awesome Macy’s!! Bag is perfect for glasses too!!! “Black eyeliner fatigue” is my new favorite phrase, thank you! I’m also with you about waterproof vs. non- mascara. It seems these days it’s not easy to find a mascara that isn’t waterproof — even with the mascara fatigue! I liked this momth’s items a lot, and the bag seems to be of a higher quality than ipsy bags. I really liked the bag this month and I have to say I like they way they are mixing the bag styles up. I don’t really have a use for last month’s bag but at least it was different. The mascara was nice. I need waterproof formulas. I liked everything this month. The bag is super cute. This would have been pretty good for me. I like the bag, the Estee Lauder product and the eye liner. Unfortunately, I didn’t buy it. Oh well…..have tons of stuff. I really liked the bag this month, too. I was looking forward to trying the eyelid primer since it is something new to me. Unfortunately, it seemed to make my wrinkles more noticeable, so that’s not gonna work for me lol. I use the bareMinerals primer and you need just the tiniest amount. Might be worth a second try, using less to see if it could work for you. Good luck!